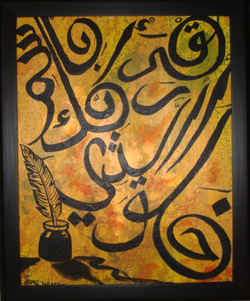 Arabic Calligraphy Workshop - Wareh Art Inspired by Nature . The Arabic Calligraphy Workshop is tailored for the Non-Arabic speaking crowd as well as the Fluent Speaker. During this Hour and Half Workshop, Participants will enjoy a 10 minute powerpoint intro into the world of Arabic Calligraphy, followed by live demonstrations and a crash course in Arabic Writing and the Art of Calligraphy. Afterwards, participants choose will each borrow a Calligraphy Pen, material to work on, and workbook. After rough drafts are complete, participants will choose a finished product to do their design on, including Magnets, Earrings, Burnt parchment paper, and Note Cards. Participants Keep their finished product and the workbook. This workshop has been done as a Team Building Workshop and can be done with our without a power point.